It's Friday! Woot! Today I have more details on my dinner with Katie Cazorla and a review of her Color Flash Instant Gel Nail Color system. 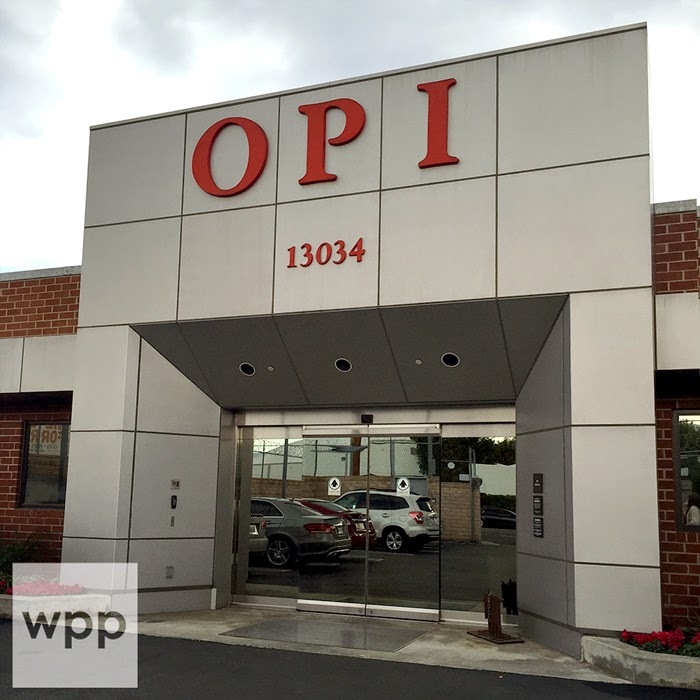 This is a long, pic heavy post! 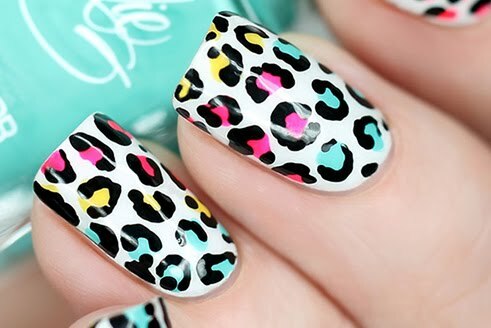 Since I know many of you are thinking "just show me the mani! ", I'll start with a photo of the final look and then work my way through the dinner, the nails, and what I think of the product. If you love nail polish, then you probably know (and surely love) the outrageous Katie Cazorla from her Hollywood celebrity salon, The Painted Nail, and her hit show, The Nail Files, on the TV Guide Network. 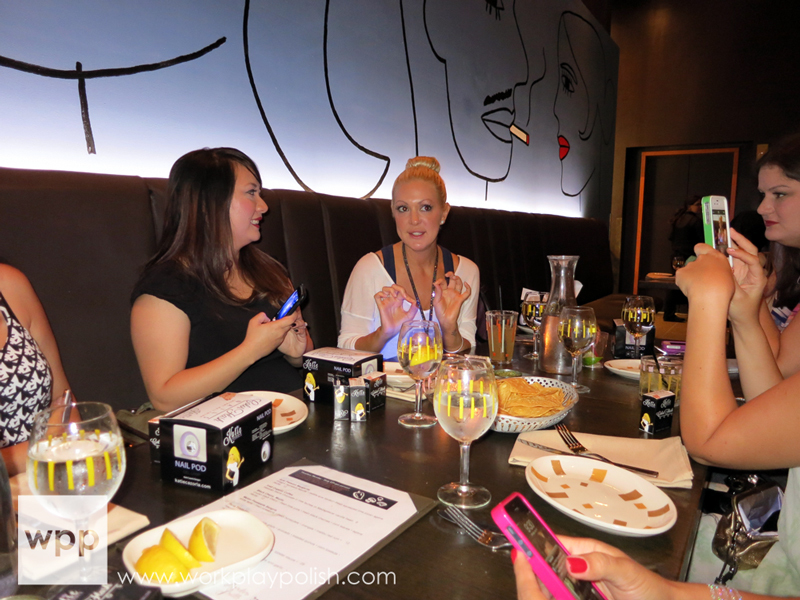 While in Las Vegas for Cosmoprof North America, I attended a small blogger dinner where Katie was the Guest of Honor. Not only was I starstruck with Katie, but I sat next to the legendary Melissa of The Daily Nail! (I played it cool, folks). There were many talented bloggers in attendance, as well at Karie Frost, the Beauty Editor of NailIt! Magazine and Beth Livesay, Senior Editor at Nails Magazine and SalonFanatic.com. Mimi from Makeup Withdrawal is sitting next to Katie in the pic below...love Mimi, love her blog! Can you believe this crowd? At one point, I looked around the table, shook my head in disbelief and thought "Wow. How did I get here?" 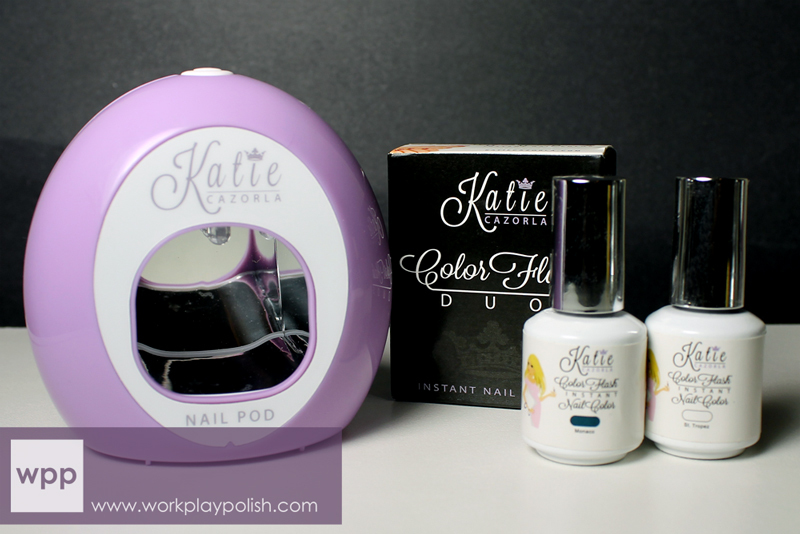 Katie generously gifted every blogger at dinner with her Color Flash Instant Gel Nail Color LED Pod and two Gel Nail Color Duos. She talked us through the system and gave a demonstration. She really believes in the product and it shows. She's so bubbly and funny...I wish she'd been my boss when I was a nail tech! (I'll save those stories for another day!) Below she's showing us the full-sized lamp. Here's the LED Nail Pod and polishes. The Nail Pod cures one (or two) nails at a time and is powered by a battery, plug, or USB cable (perfect if you're doing your nails at the computer). It's super light and portable and would be great for vacation. Katie told us she once used it to polish her toenails in the back of her car on the way to an event (one toe at a time...now that's some freakin' talent!) while her boyfriend, Walter, manned the wheel! The system is truly one step! Just start with a clean nail. No special basecoat required. Below I've used just one coat of Monaco, a navy blue, and cured it in the light for one cycle (60 seconds). The result is pretty amazing. Completely dry, shiny and ready to go. You're done. (However, if you have a heavy hand in application, I recommend you cure the nail for another cycle.) Monaco had a delicious jelly finish after one coat. I had some very slight shrinkage at the top of the nail, but now that I know how it works...I'll be sure not to let product pool at the tip. I wanted a rich Navy for my mani, so I did a second coat and a second round of curing. For the middle and ring fingers, I used two coats of St. Tropez, a clear white. Until the product is cured, it won't dry and is easy-peasy to clean up. After it's cured...not so much. So make sure you do all of your clean up BEFORE you put your finger in the lamp! After the the base colors were finished, I free-handed horizontal stripes on the St. Tropez nails using Monaco and a medium striping brush. Then I cured the stripes for two cycles each. I swear this mani is way cooler in person. 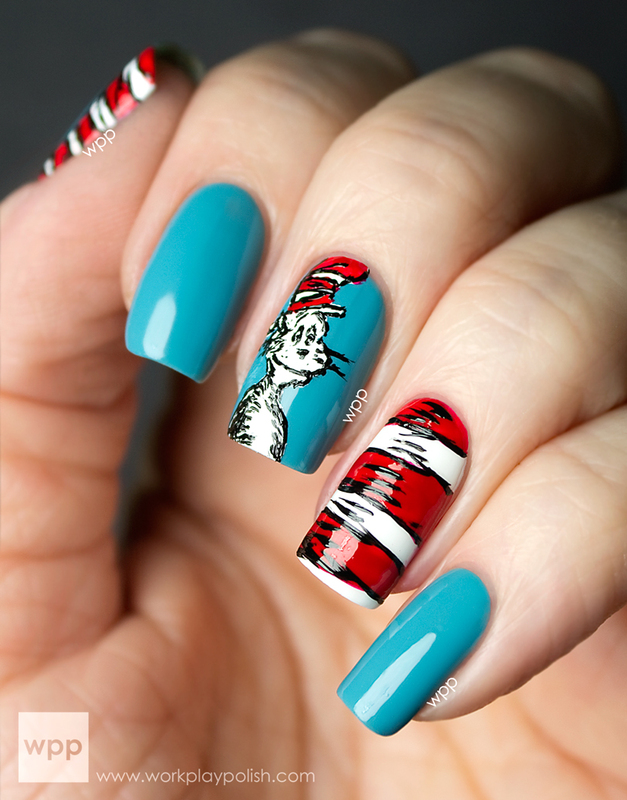 The stripes are "raised" and the blue has a neat multi-dimensional quality. Unfortunately, I won't get to test the system for wear time, as this pretty mani came off less than 24 hours later. (Boo!) But I can attest to how easy these gels are to remove. I very lightly buffed off the shine and balanced an acetone-soaked piece of cottonball on each nail (this is the lazy person's foil method). I checked it after 3 minutes and I was able to remove all the product with an orangewood stick! The system is affordably priced (the LED Pod shown here retails for $39) and the only other investment is polish (no special base/topcoats, special removers, etc.) The lamp may not be as "rugged" as other systems, but it's perfect for the at-home user who's in a hurry. In my opinion, it's a great value. The Color Flash Instant Gel Nail Color lamps and polishes are available at www.katiecazorla.com and through ShopNBC. Katie has two amazing projects in the works, so be on the lookout!! :) She's one to watch!